If you are looking for a simple way to raise the bar for teamwork, communication and collaboration in your company, here's your ticket -- Idea Champions' newly launched deck of Teamwork Cards. 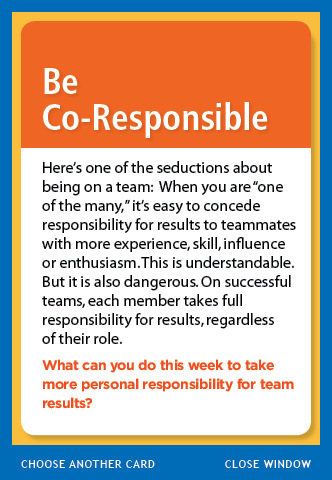 These thought provoking cards help group become teams and teams becoming high performing teams. Easy to use. Clarifying. Behavior changing. A time-efficient way to spark the kind of conversations, insights and agreements that will get you and your team to the next level of excellence. While it's true there is no "i" in "TEAM", there is definitely an "i" in INSIGHT, INTERDEPENDENCE, and COLLABORATION. 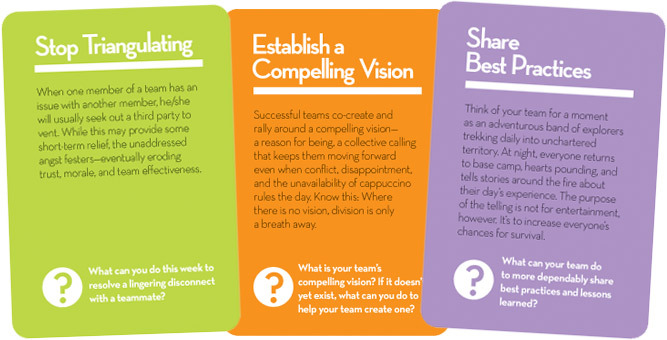 Which is precisely what Idea Champions' now-available-for-the-first-time-on-the-internet Teamwork Cards are all about. We created these cards for one simple reason -- to help our clients and the other 7.6 billion people on Planet Earth increase the odds of their collaborative endeavors actually bearing fruit. Since 1987, when Idea Champions launched, we've heard the word "teamwork" bandied about thousands of times like some kind of medieval incantation. Inspired CEOs, Senior Leaders, and Human Resource Directors invoke the word religiously and God-knows-how-many hallways and conference rooms are plastered with cheesy posters of earnest looking people rowing a boat together. Help! The actual amount of dependable, smooth-functioning, go-beyond-the-call-of teamwork in most organizations? That's a whole other story. We aim to change that. One Teamwork Card at a time. We're not saying we've invented the magic pill. We haven't. But we have invented a way to invoke some magic -- especially when it comes to groups becoming teams and teams becoming high performing teams. Our Teamwork Cards spark reflection, insight, connection, clarity, meaningful conversation, and demystify a whole bunch of mumbo jumbo about what it really takes to raise the bar for teamwork. No workshop is needed. No training. No webinar. No workbook. The cards are self-explanatory -- simple, engaging, conversation-starters for aspiring collaborators to identify exactly what they need to do differently, on the job, to make extraordinary teamwork a reality. Do you work in an organization that is trying to raise the bar for innovation, teamwork, storytelling, and leadership, but doesn't have the budget to pay for trainings, keynotes, and workshops? 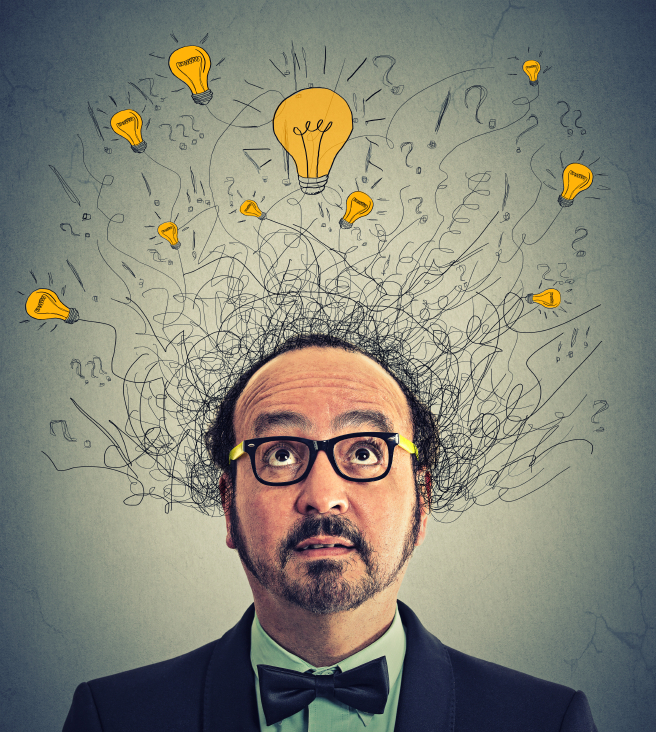 Here's an alternative -- Idea Champions' Micro-Learning for Innovators service. It all happens online. At your own pace. 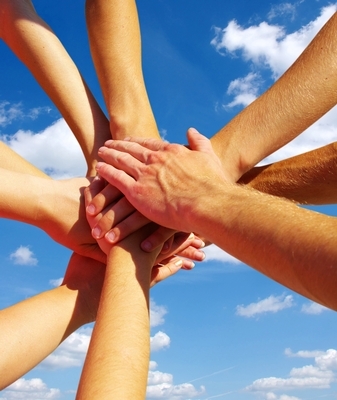 Lots of organizations acknowledge the need to raise the bar for teamwork and collaboration. That's a good thing. The not-so-good thing is that their process for doing so is often vague, insufficient, or confused. Of all the models on teamwork, Idea Champions prefers the one one outlined by Larson and LaFasto in their wonderful book, TEAMWORK: What Must Go Right/What Can Go Wrong. If you are looking for a simple, inexpensive way to spark innovation in your organization in just 15 minutes per week, here it is. No workshops. No trainings. No keynotes. 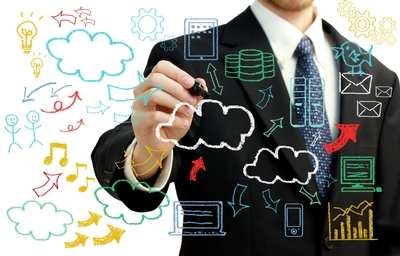 No complicated idea management software. No headbanging. And the first three companies that respond to this post get to name their own price. Here's what one of our happy clients says about this innovative service of ours. PS: If you want to know how much it costs, text me at 845.389.9096 and I'll let you know ASAP. I first heard about Shane from Tim Gallwey, of the Inner Game. Shane's coached some of the best and brightest leaders in the world, like Ije Nwokorie, a senior director at Apple, and Greg Henry, winner of the Ernst & Young Entrepreneur of the Year Award. Go for it! Why Don't More People Share Their Best Practices with Each Other? If you are a member of a team, business, school, or volunteer organization, there's a good chance you want whatever project you are working on to succeed. Yes? Towards that end, you work hard, think hard, generate ideas, go to meetings, fight fires, and (hopefully) learn from your mistakes. If you are like most people, you sometimes get together with your team and talk about ways to increase your odds of success. Still, there's a good chance you may be overlooking one of the simplest, most effective ways to make progress -- and that is the sharing of best practices. "Best practices", a much written about topic in the business literature, is really nothing more than a two-word euphemism for "what works" -- the efforts you and your colleagues make that are already contributing to your success. The good stuff. Curiously, however, "best practices" are rarely shared in most organizations and, even when they are, they are not shared effectively. Why? There are ten main reasons. 1.Command and Control: The leaders of most enterprises, even if they won't admit it, aren't really committed to people sharing their ideas with each other. It sounds strange, but it's true. Why does this phenomenon exist? Because ideas, freely shared, often end up "rocking the boat." Old ways of doing things get challenged. The status quo gets confronted. New possibilities need to be considered, evaluated, and funded. Or not funded. More emails abound. More opinions. More disagreements. More meetings. Cranky-inducing stuff. 2. No Clear, Compelling Vision of Success: If people, working on same project, aren't on the same page about WHY they are working together and WHY they get out of bed in the morning, it is unlikely that they will be motivated enough to go beyond the "same old, same old" syndrome. Without a clear, compelling vision to motivate them beyond the call of duty, many people end up just going through the motions. Rote takes precedence. Old habits rule. Mediocrity prevails. 3. No Sense of Interdependence: People will not take the time to share their insights, ideas, and best practices with each other if there is no recognition of the need to collaborate. If teamwork is not a clearly articulated (and reinforced) organizational value, there will be very little chance that the people doing the work are going to make the effort to connect with each other. 4. Lack of Trust and Appreciation: People may recognize the need to collaborate with each other, but they may not like or trust each other. It takes effort to reach out to other people -- especially people who are different than you. Sometimes, it's a risk, especially for introverts. Plus, if people are working in remote locations, in different time zones, the degree of difficulty increases. Without trust and a genuine appreciation for the perspective of others, best practices will rarely, if ever, be shared. 5. No Clarity About What a Best Practice Is: If you ask me to bring a tuna fish sandwich to a meeting, I can do that. But if you ask me to bring a "best practice", who knows what you'll get. If you want best practices to be shared in your organization, be very clear about what you are asking people to communicate. 6. No Intention. No Agreement. No Buy-In: It's fine to generically request people to share their best practices, but unless your request is understood, honored, and owned. it's just fairy dust. People are busy. People are maxed. You asking them to do one more thing will likely be met with head nods at best. So, if you want to make this best practice sharing thing real, you will need to make the effort to build a case for it and give people a chance to commit to it from an authentic place. 7. Fear of Judgment: Some people have a truckload of best practices to share, but they are sometimes concerned that other people may not think their best practices are so hot. Or, if they've done something they think is truly innovative, they may be concerned that others will judge them for not asking permission or going one bridge too far. The result? They clam up and keep things to themselves. 8. The Perception of Lack of Time: Face it. We live in an ADD world. Even the fact that you have read this far is astounding. If a person thinks they have no time, there is very little chance they are going to say YES to a "best practice sharing process" that will take some time -- even if the process, itself, will yield ideas that will save them time and radically increase their odds of success. 9. 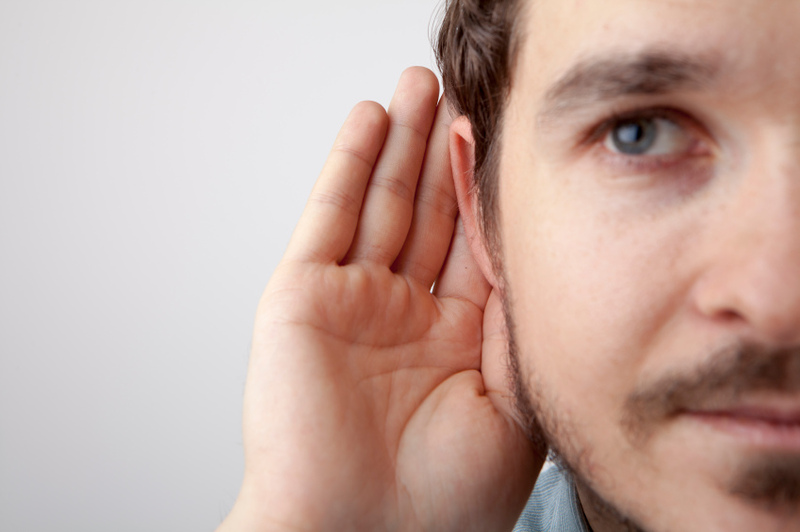 Lame Listening: The sharing of best practices requires two things: someone to speak and someone to listen. Most of us, of course, would rather speak than listen. If you and your team are committed to sharing what you are learning with each other, make sure that listening -- real listening -- is baked into the process. 10. No Platform: Sharing best practices with other people requires some kind of communication method or platform. If your team does not have a reliable way to share what they are learning, it's doubtful they will. What platform might work best for your team? Group skype calls? One-on-one phone calls? Monthly meetings? Email? A Facebook Group? An end-of-the-year conference? A blog? What other obstacles would you add to the above list? But more importantly, what can YOU do in the next seven days to jump start the process of the team you work most closely with sharing their best practices with each other? On a scale of 1-10, how connected are YOU to your community? And if your reply is "8" or less, take a moment and ask yourself how you can become more connected. 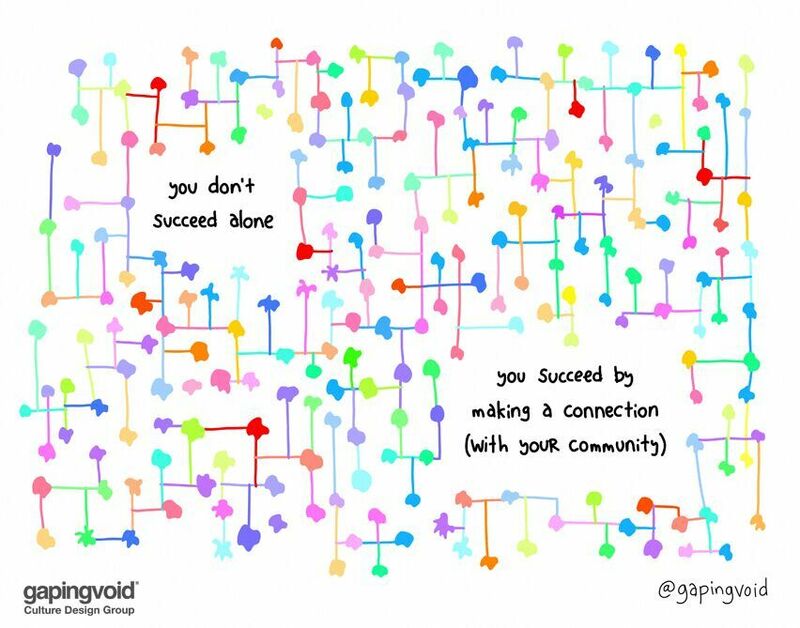 Speaking of which, here is a cool online creative thinking tool about the power of making connections. I have a confession to make. Actually, it's more like a revelation than a confession. 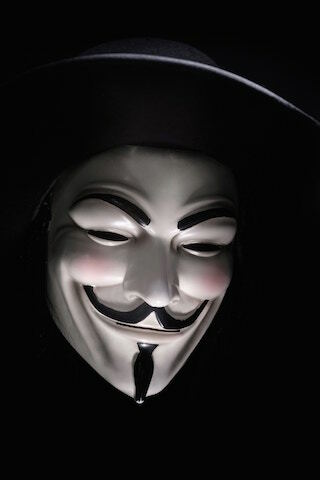 You know all those fabulous quotes and articles you've read over the years with no attribution other than "Anonymous"? It was me. It's true. I have written thousands of things I've never signed my name to. I couldn't. I mean -- the writing just came through me. Like a storm. In fact, I was in such a state of presence as these pearls of wisdom appeared, there wasn't even a "me" involved, so how could I sign my name? So I did the only thing I could do -- and that was to sign what I wrote with the now all-too-familiar word "Anonymous". Please don't get me wrong. I'm not complaining, nor do I have any regrets about my selfless decision. It felt right at the time. But now, with another year and a half of college tuition to pay for my fabulous creative daughter -- it's starting to make sense that I claim what is rightfully mine. After countless hours of consultations with pundits, epistemological savants, numerologists, and intellectual property lawyers, I've arrived at an approach that is not only honorable and fair, but flawless and timely with absolutely no carbon footprint. Nor were any animals harmed in the writing of this paragraph. I am pleased to announce that YOU, dear reader, get to play a key role going forward -- one that will take you less time than it will to order a take-out pizza. Since I am claiming no royalties whatsoever from my past writings (many of which, by the way, went on to become blockbuster movies, novels, bumper stickers, and refrigerator magnets), I think it is only fair to request that every time, from now on in, you encounter anything attributed to "Anonymous" you link it to my website or any of the following cyberpalatial residences of mine. My goal? To model what it is like to claim one's true inheritance and take the risk that this post will go viral and I will have to answer a lot of questions from slick talk show hosts more interested in their own TV ratings than my no longer anonymous success. Good article from Fast Company on the emotional intelligence required to be a better listener. One of the biggest challenges that internal change agents have when it comes to fostering a culture of storytelling in the workplace is building the business case -- why it matters and what the impact can be. The quote below, from John Kotter, author of Leading Change, will help. If you need help building your case, shoot me an email and I will send you some more "grist for the mill" -- links to compelling articles and videos on the topic. A guest post by Idea Champions' newest leadership development consultant, Dr. Barry Gruenberg. When those in senior leadership positions avoid conflict among themselves, the unresolved conflict ripples throughout the organization and paralyzes action at every level. Key issues go unresolved and the tension at the top pervades the organization. Followers of each of the powerful protagonists must constantly demonstrate their loyalty to their sponsors in their words and deeds; they must scrutinize all that they do to ensure that they are not seen as violating the party line. 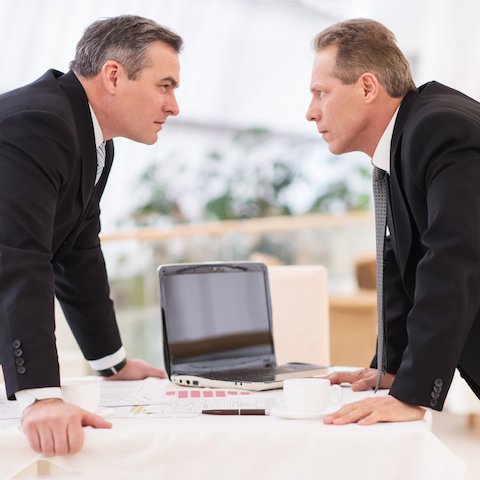 Lower level employees are often enlisted to participate in task forces or committees to deal with the various by-products of the unresolved issues. These efforts are virtually guaranteed to fail since any recommendations for resolution will compromise at least one of the contending senior managers who will usually use their power to veto the idea, leaving the task force frustrated and progress hindered. This is ironic because the members of the task force will have attempted to remain loyal to their constituency throughout the proceedings and will usually feel that they have salvaged the most important interests of their group in the negotiation process. But the senior managers, who have delegated their conflict, will generally take an all or nothing posture on the outcome. The only true resolution to this phenomenon requires the direct participation of the protagonists -- their committed effort to resolve their differences before the symptoms of their misalignment irrevocably muddies the organizational waters. Why create a culture of storytelling? Making great music together isn't always easy, no matter how famous your band is. Nor is it easy being business partners, collaborators, teammates, or "significant others". If you want to make some serious music together, "creative dissonance" is inevitable. Count on it. The question isn't whether or not band mates or business partners will experience breakdowns. They will. The question is how committed are they to breaking through and coming out the other side. When my mother was alive, she told me she had no idea what I did for a living. Around the canasta table, she would tell her friends I was a "motivational speaker", no matter how many times I explained what I actually did. The slide show below is dedicated to her and to YOU, too -- especially if you're wondering what the heck goes on in one of Idea Champions' innovation-sparking workshops. Best to view full screen. Unless you've been in solitary confinement for the past few years, there's a good chance you are a member of some kind of team. 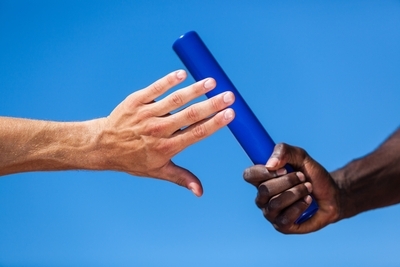 There's also a good chance that the team you are a member of isn't always "high performing." Different issues come up from time to time that sabotage the team's effectiveness and trigger frustration, wheel spinning, and lost opportunities. Sound familiar? If so, this is your lucky day. Idea Champions (that's my company) is in the final stages of producing a deck of cards that will help teams get to the next level of connectedness, communication, and collaboration. Before we release the deck, we are offering you and the rest of the known universe a SNEAK ONLINE PEEK. 2. Scroll until you see the "We're All in This Together" icon in the sidebar. 5. Mouse over the card and click "next" for card #2 and so on. There are total of 52 cards in the deck. 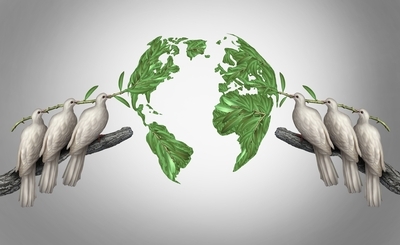 Is Peace the Innovation We Need the Most? "Innovation" continues to be a hot topic in corporate circles these days -- a "competitive edge" organizations are increasingly attempting to hone so they can not only differentiate themselves from the competition, but survive in today's topsy turvy economy. That being said, there are some forward thinking organizations out there who are going beyond the status quo and seriously asking themselves what they can do differently to not only be "socially responsible", but use their corporate clout to help various peace-themed global causes truly impact positive change. If that describes your organization, please contact us. 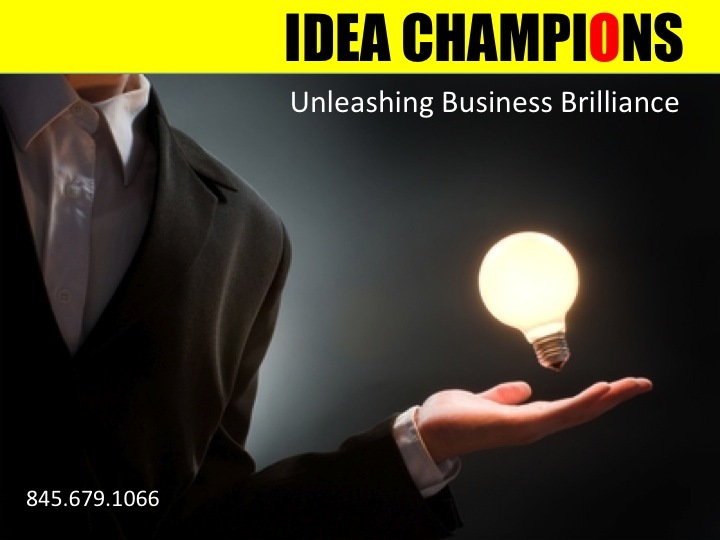 Idea Champions, in 2015, will be launching a new innovation-sparking service to help corporations, world wide, figure out HOW they can leverage their resources, bandwidth, and brainpower to foster peace and well-being in the world -- and still make a profit. That's what we do. And below are five ways we do it. "I wanted to thank you for the wonderful work you've done for us at Life Care Centers of America. As you know, when I left my CFO position at Olin Corporation to help lead Life Care, I was presented with a number of difficult challenges. Due to strict government regulations, the long-term care industry was in turmoil. In 30 years, Life Care had not performed any unified, long-term strategic planning, and there was no HR department for over 27,000 employees. Based on the excellent work you did for over five years with my former company, I knew you had the skills to help us. Your role in aligning 230 different facilities into a unified force has been remarkable, especially in the short time frame you were given. As you know, the results of the process you took us through have been astounding. In an environment where five of the top six public nursing home companies have declared bankruptcy, we have enjoyed unprecedented growth. You helped our senior officers transform into a dynamic leadership team. Our clarity around an aligned mission translated into a powerful vision that we can communicate to the rest of the organization. Your Vision Mapping sessions were the catalysts for communicating our message to the rest of the organization. Your ability to develop balanced scorecards for all 230 facilities was the key to translating strategy into results. It is now clear what actions are important for us to take, and for the first time, our people know how their success will be measured. From the senior level to the staff in each facility, actions are now aligned to achieve strategic goals. As an interesting byproduct of your work here, we are beginning to develop leaders at all levels in the organization who are empowered to do whatever it takes to get the job done. They have a clear line of sight to the strategic goals and are stepping up to the plate to get them done. I am proud of how we have responded to the process you have embedded into our culture. Thank you for justifying my faith in bringing you in to facilitate this major change in how we operate. I look forward to continuing our work together in developing a high performance organization." 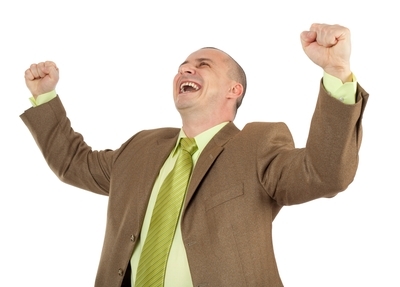 A recent poll has revealed that 62% of Americans are dissatisified with their work. While there are a lot of contributing factors, one BIG factor is that most workplace environments are not wired to bring out the best in people. Quite the contrary. That's what my newly published article in the Huffington Post is all about. It doesn't just name the problem, however. It also provides a simple "starter kit" for how each and everyone of us can begin to humanize our workplace environments. 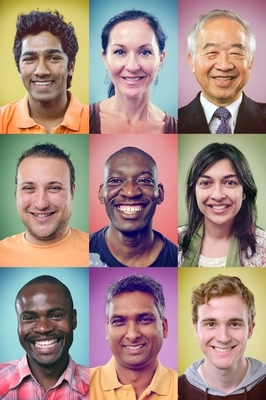 Click here to weigh in on the topic by responding to my Humanizing the Workplace poll. If you want to register for my April 4th Telesummit on this topic, click here. It's free. NOTE: The following article is authored by Sarah Martha Jacob, founder of Tangolia. There are two kinds of people in the world. One looks at a new possibility through the eyes of fear. The other looks at a new possibility through the eyes of faith. I should know. I worked with both kinds of people for four years at one of the largest private investment firms in the country. So it really should have been no surprise to me when I heard their two polar opposite responses on the day I declared I was leaving my high paying job as a portfolio manager to travel the world and dance Argentine tango. "You are making a huge mistake," said the fear group. "You're a rock star," said the faith group. The fear group thought I was stark raving mad to be leaving a well-paying career to go follow .... what? My dreams? "Beware of the gap on your resume, you silly girl," was their mantra. The faith group thought I was a genius to go exploring, at the ripe age of 29, given that I had no mortgage or kids holding me back. "Go! Do it for all of us," was the excited whisper beneath their words of encouragement. Whether you make career choices out of fear or faith, it's not every day you see someone gliding off the corporate cliff and onto dance floors in other hemispheres. I didn't see it as a savvy career move as much as a campaign to save my soul. Today my career is thriving as a result of the set of tools I picked up during my tango travels. How are tango skills relevant to business? For starters, dancing tango well requires collaborating with a partner to create something you cannot create alone. 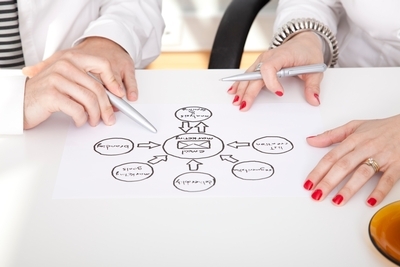 Everything in business involves collaboration: with your customer, manager, colleague, subordinate, or team. Today's complex business environment requires us to up-level our collaboration skills -- skills that are often overlooked and underdeveloped. And because they are, we end up going over and under each other -- drained and frustrated -- to get results. What follows are nine tango principles that have made me a smarter, more nimble, creative, and engaged collaborator. 1. Be Aware of My Surroundings: I am not alone on the dance floor. I have a partner and a whole room of other dancers to take into consideration. If I whip out a bunch of kicks and turns just because I think it looks cool, I'm going to piss off a lot of people. I have to let go of my own agenda and use discretion to keep the harmony of the group. Indeed, a misplaced kick with a four-inch stiletto heel can have deadly consequences. 2. Maintain a Strong Core and Be Flexible: In order to move easily with a partner, I have to maintain strength and balance which emanate from the core of my body -- my power center. But I cannot be so strong that my entire body becomes stiff and rigid. That will only block the fluidity that creates beautiful figures. Mastering the duality of strength and flexibility allows me to maintain a powerful presence while still going with the flow. 3. 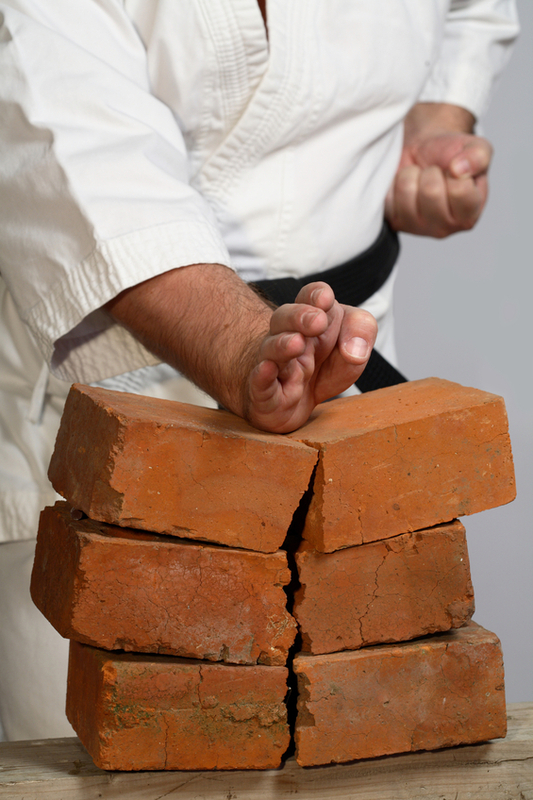 Develop Impeccable Technique: There are fundamental skills I need to master in order to play my role with excellence. It takes discipline -- hours of doing drills in an empty studio wearing high heels with no one to hang onto. Why do all this work just so I can have fun? Because it allows me to play at a whole new level -- one that will allow me to be more subtle, spontaneous, and create a precise esthetic. This is what makes it the tango and not the funky chicken. 4. It's Not What I'm Doing. 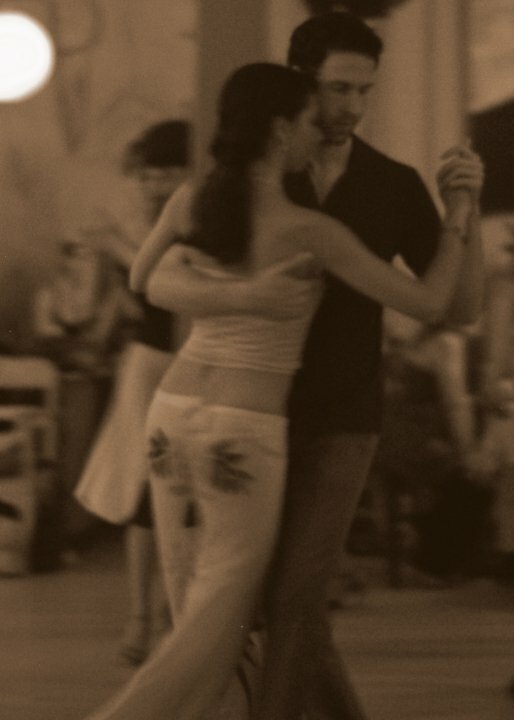 It's How I'm Showing Up: What makes a tango partner want to dance with me is not how decorative my footwork is or if my kick makes it to his eye level. It is the experience of dancing with me. I step onto the dance floor and face my partner. My spirit is open and lively and my whole being is committed, grateful, and ready for whatever is about to happen. This brings out the best in my partner. And we dance the dance of earth-shaking, heart-beating, breath-stopping oneness. Wait -- isn't this an article about business? Yes it is! You see ... there is something transcendent about human connection, and when we're in the zone collaborating together, it is electric and alive and right. This is the business we're all in. 5. Appreciate My Partner For Who He IS And Forget About Who He Is NOT: Some leaders are more skillful than others. They are just better dancers. I can either focus on what my partner needs to work on or I can focus on what he does well. Either way, it is my choice and it affects my experience of the dance. Amazingly, I have found that when I tune in to my partner's strengths, he naturally dances better and will even rise to new realms of his own greatness. 6. Don't Worry About How Good the Other Dancers Are: There will always be better dancers than I am. I can make myself crazy wondering what they have that I don't. In that mind space, I will never be enough and will keep tripping over my own feet as I mentally eject from my body and compare myself to everyone else. Rebecca may be an incredible dancer, but in the contest to be Rebecca, she will always win. I have to be at the level that I am because there is no other place to be. I can look at the masters and be inspired or shut down. I have come to enjoy the discomfort of being "less" and enjoy the unfolding. 7. Surrender and Trust: When it's show time, I don't try to control every detail (or any detail). I don't think too much or try to get it to BE something. When the stakes are high, I have to put trust in all my training, everything I have ever learned up until this moment, my innate sensibilities, and just let the dance happen. The studio is the place for practice. The lesson is the place for perfection. When the music starts, it is a moment to surrender and trust. That is the only way a truly engaged partnership can create something unique, special, memorable, and inspired. 8. Stay Curious: Who is the person that has decided to collaborate with me in this moment of dance? What does he want to experience? How does the floor feel beneath my feet? Can I hear the faint swooshing of dance shoes beneath the music? I may have danced with the same person to the same song 50 times, but maybe it has never been in these shoes, next to these other dancers, in this balmy air. There is no space for boredom or complacency when I am attuned to all the fascination one moment can hold. When I am curious, I am open and present, and I somehow know just the right thing to do and say -- or not say. 9. Be Authentic All the Time: It used to be that there were all these very different roles I played. There was the professional (uptight, serious), the daughter (suddenly helpless), the girlfriend (princess), and the salsa dancer (vixen). Dancing tango required me to be so focused that my mind stopped and all the mental chatter about who I was and how to be just faded away. All that remained was pure essence. What emerged was a person who was creative, playful, disciplined, earnest, humble, and sweet. I came alive and others were attracted to that spark. I now bring myself fully to everything I do, and I commit to being authentic in every situation. My clients don't hire me to exchange dollars for skills. They engage with me because they want to collaborate with someone who is real and awake and totally into it with them. How would your business relationships change if you shifted into thinking about them as dance partnerships? Most high level executives do not expect a lot of recognition from others. Neither do they give a lot of recognition to others. Many managers are like the classic husband who, when his wife complains that he doesn't tell her he loves her any more, responds that he told her he loved her when he married her -- and would have let her know if anything had changed. Similarly, most managers act as if the act of hiring an employee is recognition enough -- this in spite of the fact that every one of these managers wants to be valued and appreciated by their superiors, and is regularly disappointed by the lack of appreciation coming their way. In today's workplace, there is a great fear that only the most extraordinary achievements warrant recognition and that all "just good" performance is merely what should be expected and does not require any special recognition. The fear most manager's have? That "excessive" recognition will dilute the praise they give and reduce future motivation for outstanding performance. The data, of course, indicates otherwise. Acknowledgment of good performance increases the probability of more good performance. And specificity of feedback -- telling people exactly what you liked about what they did and why you liked it -- dramatically increases the likelihood of that performance occurring again. If we can get to a place where we are more generous and specific in the expression of our positive feedback, we will notice, in time, a dramatic increase in the quality of employees' performance and their overall satisfaction with work. Our World Wide Webinatrix Speaks! The writers of this blog are excited, thrilled, and tickled to announce the launching of a entirely new service to the known universe: Webinars powered by Idea Champions University. Having spent the past 25 years delivering a wide variety of innovation-sparking workshops, trainings, meetings, conferences, and consulting interventions to forward thinking organizations everywhere, we've decided to let go of our addiction to Frequent Flyer miles and go virtual. 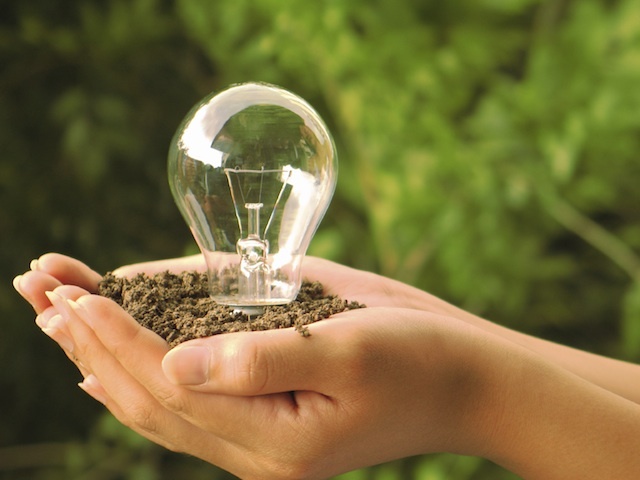 Our new venture began with a simple question: "How can we have the biggest impact on the most amount of people in a cost-effective, highly engaging, low carbon footprint way?" The answer? Build a webinar curriculum and deliver our services online. Which is exactly what we've done and will continue to do as long as the need in the marketplace exists. Bottom line, if you're looking for a better way to build the core competency of innovation, you've come to the right place. No airfare required. No cabs. No sending your people to overpriced hotels and wondering whose gonna cover for them while they're eating muffins and collecting one more three-ring binder they will never read. Operators are not standing by. But our website is. And so is our integrity -- the collective mojo we've built for the past 25 years with some of the finest organizations in the world. So visit us online to learn more about what we're offering. And while you're at it, feel free to register for one of our upcoming open-enrollment webinars -- a great way to kick our virtual tires. If you are one of the first 50 people to register, you'll receive a 50% discount and a free annual subscription to our highly regarded online Free the Genie app. If you'd rather schedule a group webinar (for up to 100 people), contact Sarah Jacob, our World Wide Webinatrix. For years I was trying to figure out what all my clients had in common. Opposable thumbs? Yes. The Isle of Langerhans. That, too. Big, fat opinions about everything. For sure. But even more than the aforementioned stuff in the preceding paragraph which you just read and probably haven't yet forgotten even though your short-term memory is getting shorter by the nanosecond and you're probably wondering, by now, why I'm rambling on and on when most blog postings are supposed to be short and sweet, it dawned on me one fine day as I was scraping marinara sauce off my shirt that the main thing all my clients had in common was the blues. Yes, indeed. The blues. The same blues Muddy Waters had. And Robert Johnson. And BB King. Those blues. Unlike the blues greats, however, my clients didn't have a way to express their blues. And, in the absence of this opportunity, their God given right to get right was lost. But no more, brothers and sisters! No more! Now, even the most buttoned down, white collared, bow-tied creators of spreadsheets at midnight have a chance to get those business blues off their chest and move towards a better future -- not to mention have fun, collaborate, and learn what it takes to innovate on the fly. Ladies and gentlemen, without any further ado, allow me to introduce you to the world's first business blues band -- Face the Music!. 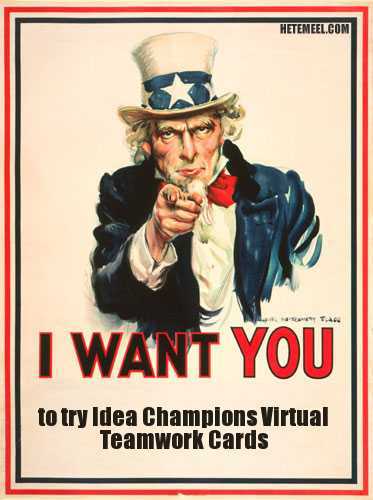 PS: Should you decide to contact them, be sure to mention that it was Idea Champions who sent you. (We give 5% of our referral fees to TPRF, one of the most well-run and inspired humanitarian organizations in the world). A few weeks ago, my wife and I had a huge fight. A doozy. The Superbowl of all fights. If you're married -- or ever were -- I'm sure you've had at least one of these. Probably more. You think you're right. They think they're right. You attack, they deflect. They attack, you deflect. You get hopeless and weird. They get hopeless and weird. And both of you -- self-appointed judges in a supreme court of your own creation -- feel diminished, abused, blamed, hurt, ignored, dissed, damaged, and demonized. The love? Out the window. And the window? Stuck in a half-closed position. Whenever I'm embroiled in this kind of dynamic and (hallelujah!) manage to make it out the other side, I get majorly humbled -- all concepts of myself as a conscious, loving, evolved human being completely blown to smithereens. And yet... no matter how painful the experience, something good always comes out of it. A phoenix rises from the ashes. Like the list below, for example -- my wishes for my dear wife, Evelyne, (the day after) and, by extension, you, me, and all the other 8 billion people on planet Earth. 39. Understanding what Krishna meant when he said: "The world is an illusion, but you have to act as if it's real." 63. Reframing aging as "becoming an elder" instead of "getting old"
67. Did I mention foot massages? 85. Understanding this quote: "When you're on the path it's a mile wide, when you're off it, it's razor thin." Look around you. This is not the time for lone wolves, closet geniuses, unaffiliated mavericks, out-of-orbit freelancers, hidden agendas, sole proprietors, superstars, cranky collaborators, or hyper independent dreamers. Sorry. Wrong decade. Now is the time for alliances, partnerships, collaborations, and team chemistry. If you are trying (heroically) to "get something done" and it just ain't happening, pause for a moment and take a good look at how you are operating. If you don't have a team of committed collaborators, allies, and partners in place, it will be very challenging to get the inspired results you are imagining. Make sense? If you are looking for a simple way to improve teamwork in your organization, click on the "We're All In This Together" banner in the sidebar. 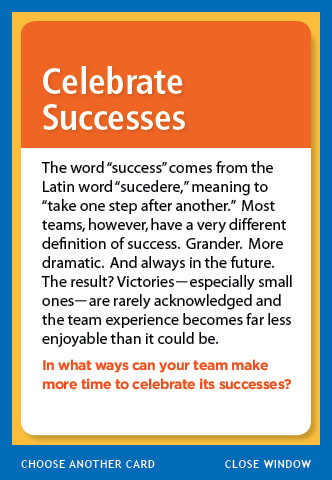 What you'll get is a series of 53 Teamwork Cards newly published by the writers of this blog, Idea Champions. 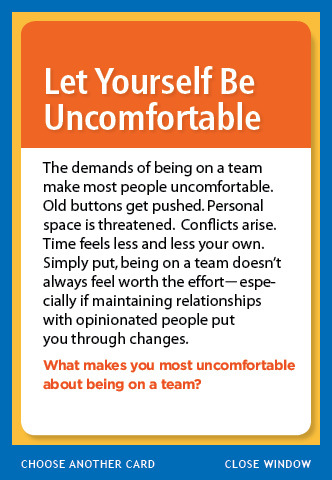 Each card describes a quality of a high performing team and then poses a question for reflection. The cards spark dialogue, insight, and the kind of positive changes that increase a team's ability to accomplish the seemingly impossible. If you want to license Teamwork Cards for your intranet, click here. Mitch Ditkoff and I have an interesting mercurial chemistry when we get together. Certain things get completed when we riff and improvise. He and I, and the rest of the Idea Champions crew, have all been talking about what creates a culture of innovation for a few years now. Often, all it takes is two people who have what I call "creative resonance." Show me any two people who can agree and disagree with equal enthusiasm and respect and I'll show you a duo who can brainstorm persistently at high heat. A great new series on Creative Pairs at Slate talks eloquently about the dynamic balance and high energy the right two people can create when they "complete" each other. As a successful professional songwriter, I grew up loving the songs of John Lennon and Paul McCartney, Mick Jagger and Keith Richards, and older teams like Rogers and Hammerstein, the Gershwin brothers, and Lerner and Lowe. It makes perfect sense to a songwriter that creative pairs would launch some of the most successful companies of the last 35 years. The creative boom in digital technology started in the early 70's with Bill Gates and Paul Allen, Steve Jobs and Steve Wozniak, and continued a generation later when Larry Page and Sergey Brin created Google. 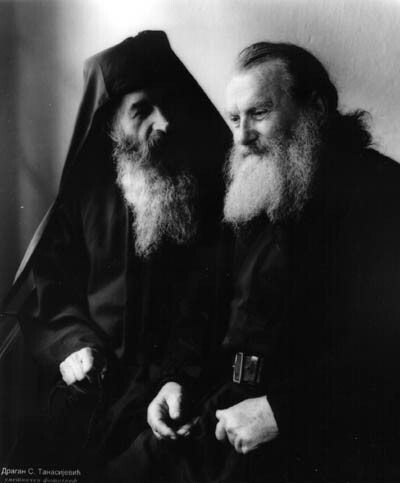 Great duos exist in every vocational and artistic field: Watson and Crick, Gilbert and Sullivan, Engels and Marx. Two centuries ago, breakthrough composers often arrived in pairs, pacing each other even when they weren't working as teams: piano innovators Chopin and Schumann (both born 1810), opera titans Wagner and Verdi (both born 1813). Creative pair chemistry ignites when two people spontaneously strike a agreement to both compete and collaborate with each other simultaneously. That tension between collaboration and competition is more easily achieved and managed in pair relationships than any other kind of team configuration. Joshua Wolf Shenk's Creative Pairs series is now in its third installment at Slate. Part 1 of Inside the Lennon/McCartney Connection starts here and continues on to Part 2. If you really want to see how simple the crucible of creativity can be, be sure to keep following Shenk's series. You'll think differently about that colleague you argue with all the time. One little tweak, a mutual change in attitude and mindset, and something magical could happen. If you are committed to accomplishing extraordinary results, chances are good that you will need to collaborate with others. Your ideas and dedication, no matter how inspired they may be, will never be enough by themselves. It takes a village. Most people's experience of being on a team -- especially those who work in large companies -- is less-than-ideal, filled with frustration, power struggles, and the belief that it's not worth the effort. OK. Those days are over. No matter how disappointing your experience of teamwork may have been in the past, it's never too late to turn things around. And it all begins with AWARENESS -- tuning into what's actually going on with you and your team. Intrigued? 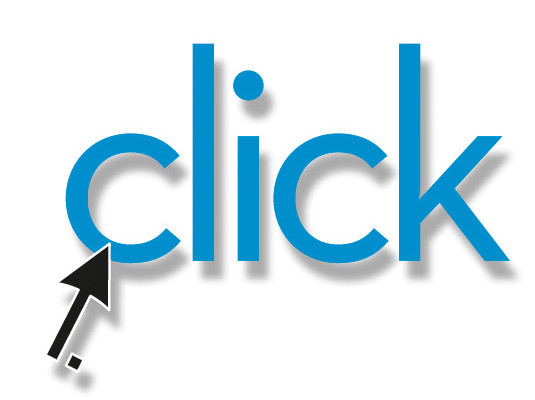 If so, click here and take Idea Champions' online TEAM REALITY CHECK poll. In a few weeks, we'll post the results here -- a way to help you and your team get into deep dialogue about what it will take to really collaborate in 2009. 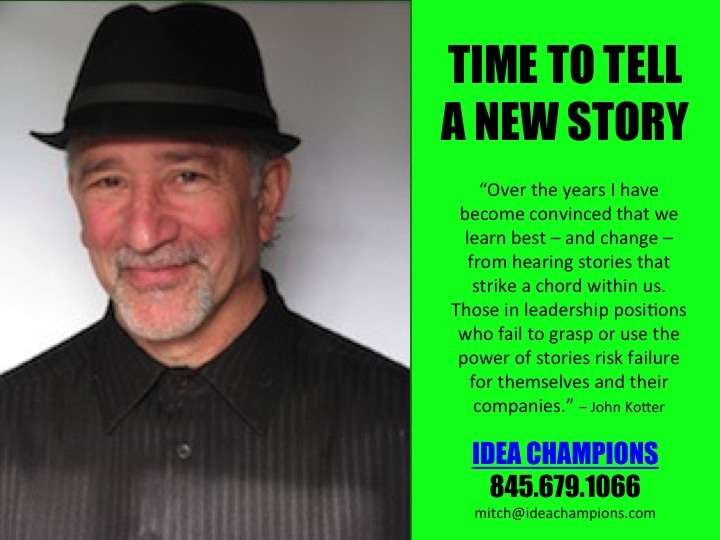 In a nice and unexpected coincidence with the kickoff of our blog here, the Quote of the Week in the current InnovationWeek newsletter is from our own Mitch Ditkoff, President and co-founder of Idea Champions. The newsletter is published by the respected InnovationTools.com. "In today's flattened, restructured, downsized organization, your role is much more than getting the best out of people. It's getting the best out of the best part of people - out of their inspired imaginations, their ability to dream, conjure and conceive - and transforming those inspired ideas into the products, services and improvements that will not only keep your business humming, but make the world an even better place for all of us to live." The quote comes from near the end of an article of Mitch's, "Innovation Coaching, The Manager as Idea Midwife." The article also appears on the InnovationTools site (demonstrating at the very least what a thorough reader their Chuck Frey is). When talking (or blogging) about practical innovation in the corporate world, there's no better place to start than 3M, a company whose name has become synonymous with the word. 3M is committed to 30% of its revenues coming from recently introduced new products. Impressive, indeed, but how do they do it? Dr. Larry Wendling, VP of 3M's corporate research labs, revealed 3M's "secret weapon," in what he refers to as the "Seven Habits of Highly Innovative Organizations." 1. Totally commit to innovation from top management on down. 2. Actively maintain an innovative culture. 3. Maintain a broad base of technology. 4. Encourage formal and informal networking. 7. Tie research to customers. It all makes perfect sense, of course, starting with Wendling's first habit, the commitment of top management. But the fourth habit, what Wendling calls 3M's "secret weapon," is often overlooked, or even ignored, much of the time in organizations. In Rowell's words: "Talk, talk, talk. Management at 3M has long encouraged networking -- formal and informal -- among its researchers." I think Wendling calls this 3M's "secret weapon" because so few other companies do this well, or are even aware of its importance. But what could be more important to innovation than encouraging the collaboration and teamwork we know lies behind every innovation since the invention of the wheel? This is where the "silo" mentality and the "not invented here" syndrome intrudes on an innovation culture. Strict, formal reporting structures, loyalty to business unit before the organization, and the human tendency to only interact with people who already share our own views and experiences, all come into play. Any or all of these can block, or at least slow down, many companies' internal "network of innovation." 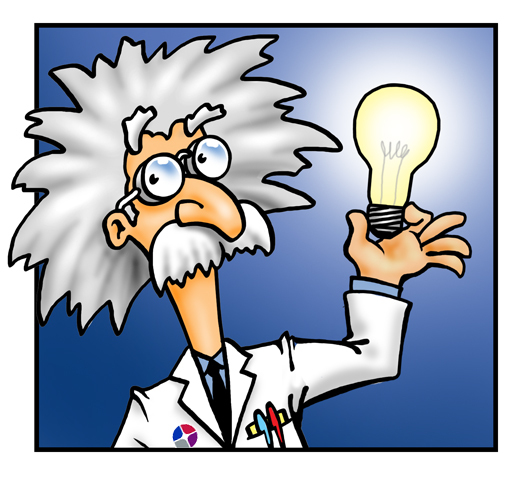 I can't tell you how many times I've facilitated a brainstorm session at a major corporation when a proposed idea will get criticized, or even rejected, because the development of the idea would involve another department or business unit! Sometimes the excuse is that there is no protocol for working with the other unit, and one would have to be created. Sometimes there is a poor previous history of collaboration between the two departments, (often involving, unsurprisingly, the two people at the top of each division). In any case, I can't help but wonder how many great ideas fall between the cracks because executing them falls between the purviews of two different departments. And, unfortunately, it is in space between two major realms of focused business activity where we would expect to find some of the most exciting and profitable innovations! So, how does YOUR company's culture deal with employee networking? Does it encourage employees reaching out across organizational boundaries to share insights and ideas? Does it ignore this important aspect of innovation? Or is it actually hostile to it, punishing employees who reach out to others in order to get something started? 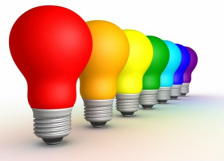 Here's a relatively cost-free way to improve the culture of innovation of your organization. Take advantage of 3M's experience and success and make employee networking your innovation "secret weapon" as well. And, yes, you ARE allowed to do that!